Nautilus and Thunar have a such context menu option under Properties/Permissions, but not PCManFM, Lubuntu's default file and desktop manager (at least not yet in the present v. 1.1.). 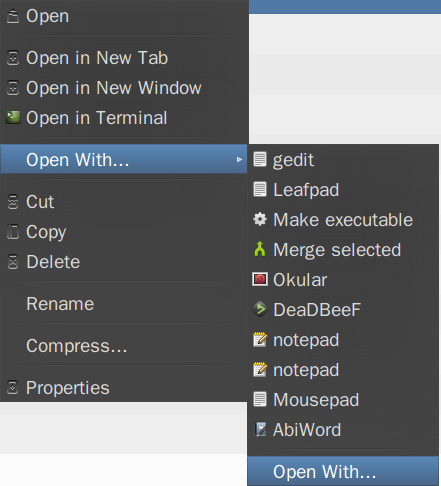 But under "Open with"/(again)"Open with"/"Custom command line", it is possible to add new custom commands. This creates a file with extension .desktop in ~/.local/share/applications which can be edited further so as to get a proper name and icon. 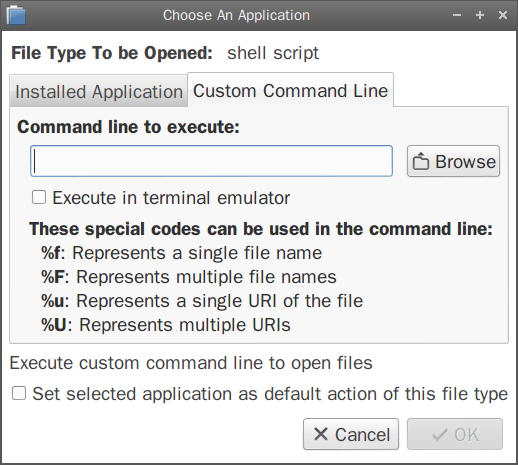 What is the command to add in this way for making a file executable? That is: how to use sudo chmod +x filename to make it work in this way? For an application to appear in the context menu, it may need a desktop file in /usr/share/applications, but also you may need to edit as administrator /usr/share/applications/mimeinfo.cache and in the line of the intended file type to add the application.desktop. So, in the present case, open /usr/share/applications/mimeinfo.cache and add make_exec.desktop to the line text/plain. Those created with Nautilus configuration tool (for Nautilus) appear in PCManFM too. These are .desktop files created in ~/.local/share/file-manager/actions. So, they can be added manually without the Nautilus tool. The form of these files should be like those presented here or here. How to convert flv file(s) to mp3 from PCManFM's (Open with) context menu? How to remove duplicate element from context menu?